The RIS COMEX kick-off meeting has brought a great start and important discussions under the roof of the beautiful venue provided by the Federal Ministry of Transport and Digital Infrastructure in Berlin on the 17th and 18th of January 2017. The event started with a warm welcome by Mr. Michael Behrendt followed by motivating key note speeches of the German Parliamentary State Secretary Ms. Dorothee Bär and the European Coordinator of the Rhine-Danube Corridor Ms. Karla Peijs highlighting the importance of the project initiative. Furthermore, the participants were introduced to the project details by the project coordinator Mr. Mario Kaufmann and the leader of the project management team Mr. Ivo ten Broeke. As important outcome of the kick-off meeting, Mr. Pieter Janssen (Rijkswaterstaat) has been unanimously assigned as chairperson of the established project Steering Committee. On the second day the activity leaders presented the detailed objectives, tasks, responsibilities as well as the expected results of the project and highlighted the challenges that the consortium is going to face in the upcoming 4 years until the successful closure of the project. 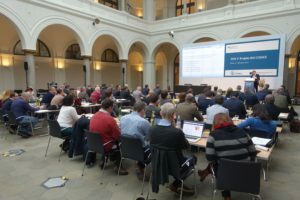 The project management team would like to thank the keynote speakers and all participants for their contribution, especially the colleagues from the German Ministry of Transport and Digital Infrastructure for hosting this memorable event!